Dragon Anywhere is a professional-grade, cloud-based dictation solution for busy professionals who want to work faster and smarter using their mobile device. 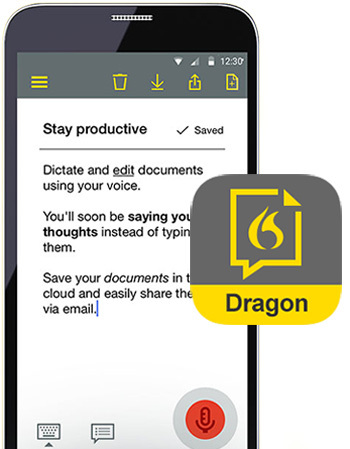 Dragon Anywhere lets you customize words, create boilerplate text or commands to quickly and accurately dictate and edit documents of any length by voice directly on your mobile device. Your document can be shared, customizations synced up with your Dragon desktop product, so you can continue your work seamlessly wherever you go. By being more productive on the road, you can focus more time on clients, customers and strategic tasks that contribute to the bottom line. Dragon Anywhere is currently available on iOS and Android devices (US and Canada) ONLY. Create documents of any length and edit, format and share them directly from your mobile device—whether visiting clients, a job site or your local coffee shop, with Nuance Dragon Anywhere, professional-grade mobile dictation. New correction menu similar to Dragon desktop solutions . Train words feature teaches Dragon exactly how you pronounce words and eliminates spelling errors. Text export size setting to specify the font size of text output to other apps (new to Android, existing feature for iOS). General usability improvements and performance updates. Fast and accurate dictation means you can dictate immediately with 99% accuracy right out of the gate. No time or length limits means you can speak as long as you want to complete documents of any length – from a business report to an entire book! Need to fill out forms from the road? Easily create form-based templates using Dragon Anywhere’s auto-texts feature and create and fill out forms, such as client in-take forms – all in the moment. Powerful customizations, like the ability to add your own custom words specific to your industry, means even better dictation accuracy as you create documents. Robust voice formatting and editing lets you select words and sentences for editing and deletion or voice navigate through fields of a report template and apply common formatting like underline and bold. Need to share or work anywhere? Simply import and export to and from popular cloud-based document-sharing tools like Dropbox® and note-taking apps like Evernote®. Sync with supported Dragon desktop solutions and work started on the road or in the field can be completed back at the desktop for seamless document workflows. All communication with the cloud is secured. The app does not access your personal information, such as your location or contacts. Purchase your Dragon Anywhere Subscription from this online store, which will setup your user account. Launch the Dragon Anywhere app and enter the email address and password you specified in the online store.